Schedule your private Arizona wakeskate lesson from our team members who can take you to the next level with our private Arizona wakeskate lessons. This instruction is generally easier after you have learned how to wakeboard and wakesurf. Wake skating is like a skateboard on water. Arizona wakeskate lessons are great for people who love skateboarding, and want more difficulty in a water sport. Wakeskating will take more balance and patients than learning other water sports, but is well worth the time. Its feels unusual not to have the board strapped to your feet while wake skating, and the board is a lot more squirrely than wakeboarding; which mean more crashes! The nice thing is; wrecks generally won’t hurt. 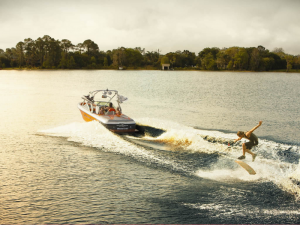 The perfect boat speed for beginners is between 15-19 mph; once you hit the intermediate and advanced stages the boat instructor will travel 19-25 mph on your Arizona wakeskate lessons. After you get up stay inside the wake, and adjust your feet on the wake skate until your comfortable. Then learning how to carve by bending your knees slightly, and leaning one way and then the other way on the board. Once you feel comfortable on your Arizona wakeskate lesson by carving within the wake, you can go over the wake by bending you knees as you cross. From there it just takes time and practice. We service all lakes in Arizona, but some of our favorite to teach wakeskating lessons are: Lake Powell National Recreation Area, Lake Mead, Lake Havasu, Lake Mohave, Lake Pleasant, Alamo Lake, Apache Lake, Bartlett Lake, Canyon Lake, Lake Martinez, Upper Lake Mary, Lahontan Reservoir, Lyman Lake, Lynx Lake, Patagonia Lake, Reservation Lake, Roosevelt Lake, Saguaro Lake, San Carlos Lake, Lake Henshaw, Lake Elsinore, Lake Arrowhead, Silverwood Lake, El Capitain Reservoir, Big Bear Lake, Pyramid Lake, Castaic Lake, Caballo Lake, and Elephant Butte Lake.